Our open top Routemaster works extremely well as a stage or a prop. We have supplied buses for many high profile events, most recent events are shown below. The iconic form of the Routemaster draws peoples attention even in the most crowded situations. The annual London 10k run finish line is in Whitehall and what better way then to have an iconic London bus welcome runners across the finish line. Our bus provided a platform for the commentators to get an excellent view of the finish line. The bus was supplied complete with a full branding package. Bluewater Christmas Light Switch on and fireworks display. Our bus took centre stage, in fact it was the stage. Heart FM breakfast presenters Becky and Jim were joined by a Father Christmas and Paddington Bear for the 2016 Christmas lights switch on, followed by a spectacular fireworks display. Along with a our Ad Banner package the bus provided a striking centre piece for this event. 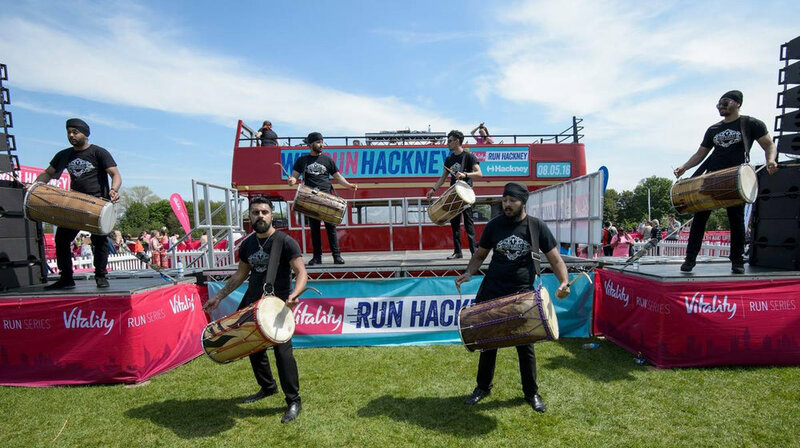 Run Hackney in summer 2016 was a half marathon event finishing in Hackney Park. Our bus was there at the finish line to congratulate runners. Providing both a central.